Have a question about Edison? You might just find your answer here! New to using Edison? Start by downloading the free Getting started with Edison guide. Questions about one of the programming languages? Each of our robotics programming languages has its own dedicated FAQ with common questions and troubleshooting help specific to that programming language. EdBlocks, a drag-and-drop, fully graphical horizontal programming language for the Edison robot. EdScratch, a vertical block-based programming language for the Edison robot based on Scratch. EdPy, a python-like text-based programming language for the Edison robot. What devices and operating systems can you use with Edison robots? Edison robots are compatible with most tablets, desktop computers, laptops and Chromebooks thanks to browser-based programming languages and the EdComm cable. All of the Edison robotics programming languages can be accessed through a browser, meaning there is nothing to download onto the programming devices you use, enabling you to program Edison on tablets, iPads and Chromebooks as well as laptops and desktop computers. Your device does need an audio jack (that’s the place where you connect headphones) input, however, to allow Edison to connect using the EdComm cable. The EdComm cable is the special cable used to download programs to Edison robots from any of the Edison robotics programming languages and connects to your tablet, computer or Chromebook using the programming device’s audio jack input. The other end of the EdComm cable connects to the underside of your Edison robot, near the power switch. This communication method is compatible with Mac, Linux, Windows, iOS and Android operating systems. How does Edison connect to my computer? The EdComm cable is how you connect your Edison robot to a computer or tablet. The EdComm cable is a special cable used to download programs to Edison robots from any of the Edison robotics programming languages. Each Edison robot comes with an EdComm cable, which is shipped in the battery compartment. To connect Edison to a computer or tablet, plug the audio jack end of the EdComm cable into the 3.5mm (1/8”) audio output socket on your programming device. The other end of the EdComm cable connects to the underside of your Edison robot, near the power switch. This communication method is compatible with Mac, Linux, Windows, iOS and Android operating systems. What barcode programs are available? Each Edison robot comes with pre-set programs already loaded in the robot’s memory. To activate the program, you simply need to scan the correct barcode. Different types of barcodes activate pre-set programs, allow Edison to be paired with a TV/DVD remote control or help you calibrate the robot. All of the barcodes and instructions are available here. 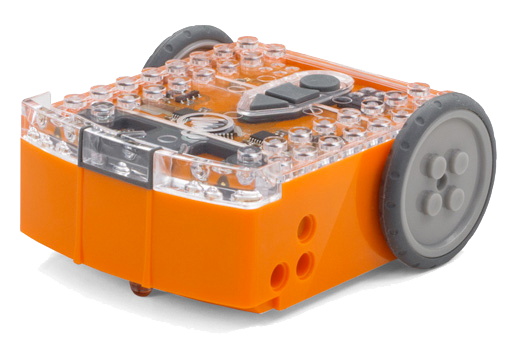 Expand, create, invent: Edison robots work with LEGO bricks! There are three types of holes on the side of Edison: pinholes, stud holes, and cross axle sockets. The three pin holes suit full depth pegs and the four stud holes suit shorter pegs. When Edison’s wheels are removed, LEGO cross axles can be inserted to create your own robotics inventions with motorised moving parts. Edison also has two sets of 2 by 8 LEGO brick connectors top and bottom, allowing them to be stacked together and built into other projects with LEGO bricks. Please note that LEGO is a trade mark of the LEGO Group, which does not sponsor, authorize or endorse this web site, or the Edison robot or accessories. The EdCreate Edison robot creator’s kit is a construction system consisting of 115 interlocking building blocks, pegs, gears, and other parts. The EdCreate system can be used with Edison robots to complete five EdBuild projects as well as a range of open-ended engineering, design and programming challenges. Edison’s activity mat (the EdMat) contains a number of barcodes you can use to get Edison up and running quickly. However a glossy lamination on the EdMat will upset Edison’s sensor and may cause errors, so the EdMat must be laminated with a matte finish. Edison takes four AAA batteries. If using disposable batteries with Edison, only ever use alkaline batteries. (These are the most common AAA batteries you will find in just about any shop.) If you are using rechargeable batteries with Edison, only use nickel metal hydride (NiMH) rechargeable batteries. Never use heavy-duty, super heavy-duty or carbon zinc batteries. Always make sure the batteries are inserted correctly. You will find detailed pictures in our Getting started with Edison guide. What coding languages can I program Edison in? In addition, Edison comes preloaded with programs which are activated through special barcodes. Where can I buy an Edison from? Edison is available from right here on our website, we offer free shipping worldwide and have discounts built into our bulk rates. Otherwise, check out our growing list of international stockists to find an Edison distributor near you! Shipping costs vary depending on your order and country of delivery. Please see our international shipping page to get an approximate shipping cost estimate. Shipping times differ by country, customs, and local post services. Please see our international shipping page to get an approximate shipping time for your location. Edison arrives fully assembled in box with a quick start guide printed on the box’s sides. An EdComm cable, the special cable used to download programs to Edison robots from any of the Edison robotics programming languages, is included. The Edcomm cable is shipped in the battery compartment of the Edison robot. lesson plans and teacher’s guides! We can currently accept purchase orders from schools in the USA and Australia. For more information please see our school orders page. Edison V2.0 has 5kB of usable space for user programs. EdWare was the original language for the Edison robot. EdWare has since been retired, replaced by our three other languages: EdBlocks, EdScratch and EdPy. You can still access information about EdWare here.